Become a member of RAIQ! 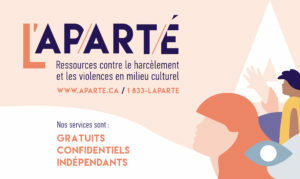 La Coalition Culture, le cœur du Québec salutes the recognition of culture but measures its satisfaction. Aboriginal artists and arts organizations from Quebec come together and sign a manifesto which has been filed with more than 40 non-native and aboriginal political and cultural institutions.